Wholesale Rock Music Merch, Band T-Shirts, Wholesale Designer Streetwear Clothing! Wholesale Band Merchandise, Designer Streetwear, Licensed Band T-Shirts, Comic, Movie & Pop Culture Tees! Band Tee Exclusives - The first of our growing catalog of Rock-n-Roll-Wholesale.com distributor exclusive band t-shirts has arrived! These exclusive licensed tees are not available from the manufacturer or through any other worldwide distributor. They're also not available at mall stores or Hot Topic. Less competition means more sales for your company! Fashionable Wholesale Band Tees for Juniors - Our fresh new line of fashion-forward band tees from Impact Merchandise includes cut tees, dolmans and premium v-necks and cropped styles for women and juniors! Wholesale Band Shot Glasses, Puzzles, Games, and more! - A new line of collectibles, barware and band merchandise is now available from Iconic Concepts. Featuring top-tier music licenses and ready-for-retail packaging, their unique slap band pint glasses, shot glasses, puzzles and playing cards are sure to be great sellers in your store! Movie and TV T-Shirts from American Classics - Check out the new licensed tees from American Classics featuring imagery from classic TV and movies like Back to the Future, Jaws, Saved by the Bell, Rambo, Rocky, Terminator and more. New customers, create a new account to view pricing and place orders. A business tax ID (reseller number) is required to qualify for wholesale pricing. Existing customers, login to your account. We offer factory-direct licensed wholesale t-shirts, designer clothing and streetwear to approved retailers. Our state-of-the-art website allows you to shop over 7000 wholesale products from some of the largest U.S. manufacturers in the country. Our currently distributed product lines include band t-shirts, rock music merchandise, designer t-shirts and streetwear, movie t-shirts, accessories and more. We're approved wholesale distributors for more than 20 leading brands. We do not sell to the general public. Factory Direct Wholesale Distribution - Most orders ship directly from the manufacturer to ensure the lowest possible wholesale prices! We now offer more than 8,000 wholesale items at manufacturer cost with no distributor markup. 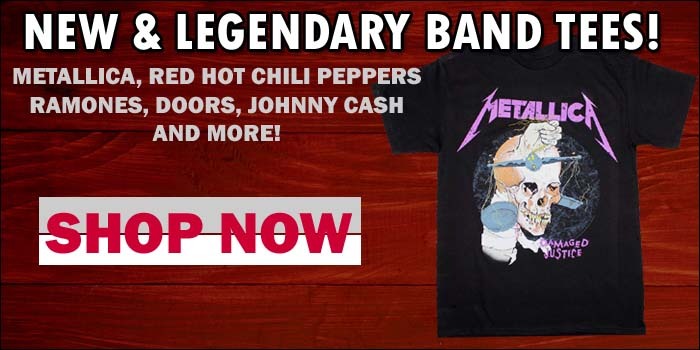 Guaranteed Authentic & Licensed Band Merchandise - All t-shirts, toys and merchandise is manufactured by companies holding U.S. licensing rights to produce them. B2C Dropship Program - Don't pay for merch before the sale! We have band t-shirts and merchandise ready to ship to your retail customers. Additional registration is required. Not all clients will be approved for this dropship program. For information please visit RocklineDropship.com. International Export Programs - We'll consolidate all of your merchandise purchased through us from multiple manufacturers in our warehouse and create a single export shipment to you to save $1000's on shipping! We now offer factory-direct wholesale pricing on 1000s of products from Impact Merchandising, American Classics, Liquid Blue, Drastic Plastic Records, Trevco Inc, Alchemy of England, Black Market Art, Annex Clothing, Lowbrow Art Company, Kings Road Merch, Iconic Concepts, Bravado Entertainment, FEA Merchandise, Live Nation, Tsurt Merch, Hi Fidelity Entertainment and more! We are official and approved distributors of all the merchandise we sell to guarantee authenticity and the lowest wholesale pricing available. In most cases, orders ship directly from the manufacturer to reduce costs even further. In addition, we pass on any shipping and freight discounts to your company that are offered by our manufacturers! If you are a new client that is interested in purchasing wholesale and have a registered business, you can create a new account here to view wholesale pricing and to place orders. Proof of business registration is required to activate a wholesale account. We do not sell to the general public. For U.S. customers, we simply require that you meet manufacturer order minimums. The order minimum for international customers is $350. All international clients are also required to meet any manufacturer minimums to order with us. Please visit this page for more information on our international order policies. If you have any questions, just give us a call at 1-888-827-4430. We're here to help. Rock n Roll Wholesale is a wholesale distributor and manufacturer sales rep agency offering officially licensed band t-shirts, music action figures, designer toys, posters and other rock music merchandise to worldwide retailers! We working directly with the manufacturers of officially licensed wholesale band t-shirts, merchandise and toys to offer retailers extremely competitive pricing on the worlds best selling licensed items for their stores. We do not sell to the general public. We soley deal in business to business wholesale of licensed TV, music, movie and band t-shirts. We also offer a unique dropship distribution program for online retailers based inside the U.S. and Canada.